Hands down one of my favorite games we have played. A mix of musical chairs and pin the tail on the donkey, this game is always a blast! 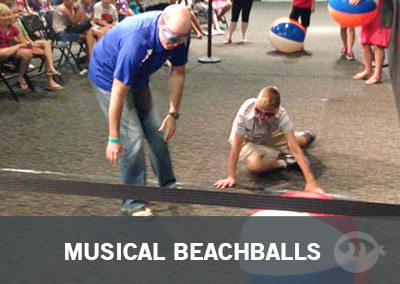 Blindfold your contestants, make them dance a little and when the music stops they have to find a beach ball. If they don’t, they are out! 1. Blindfolds (x4) . 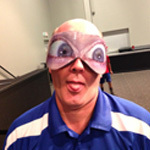 We used sleeping masks and had some fun with them by printing and gluing on huge bug eyes which makes it much more enjoyable to watch. 2. Beach Balls (x3). This is used as the “chair”, contestants must find the beach ball in order to be safe for that round. Create a playing environment that will not pose a physical threat to someone who is blindfolded. Blow up your beach balls. Prepare your blindfolds or sleeping masks (preferably with a silly face printed and glued on it). Have each of your contestants blindfolded. Similar to musical chairs, play some music and have the contestants dance around like their life depends on it, but really, make sure they are dancing it only makes the experience that much better. They have to dance the whole time the music is playing. When the music stops they must find a beach ball which is thrown in after the music stops by the game hosts. Have them search for the balls but remember they have a blindfolded on and may need your help. Phases like “it’s right over here” work incredibly because they can’t see where you’re pointing. Have some fun with it! If you start with 4 players only throw in 3 beach balls. The contestant who does not retrieve a beach ball is out. Start from the top with the music & dancing. Stop the music and let the looking begin. 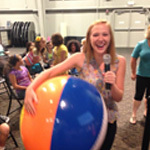 This round should only have 3 contestants and 2 beach balls. The next round should have 2 contestants and 1 beach ball. Whoever finds the last beach ball is the winner! Have fun and enjoy this great game! thanks! I just found game 1 of 3 for the winter camp sessions I am in the middle of planning! That’s awesome @yogabbagabba! I hope your your winter camp goes/went great! I was searching for a fun game for my 5th grade retro day party! I think this will be a hit!! Thanks for sharing! 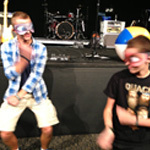 Hey were do you get those blindfold masks? They look so cool.